On the way home from Fredericton last night with other people from UNBSJ, we suddenly saw cars pulled over and someone standing in the middle of the road. 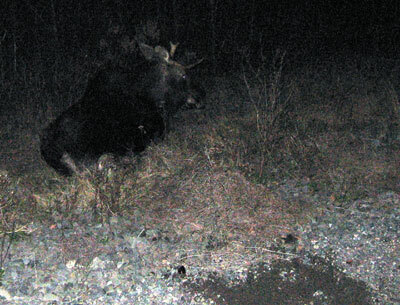 As it turns out, there was a moose in the middle of the road that had just been clipped by another vehicle. It was limping along, with it’s two back legs broken. It made its way into the ditch, bleeding all over the place as you can see. It was moving around a bit, seemingly whining a bit as well. Luckily, no people were hurt. It seems that everyone you talk to has a moose encounter along this highway, or knows someone who has. My psychology professor from first year told us in class one night about how he hit a moose with his own vehicle. I’m sure the government had the right intentions when erecting signs every 10 kilometres or so along the stretch. The problem is with education on the issue. The moose never seem to cross next to the signs!